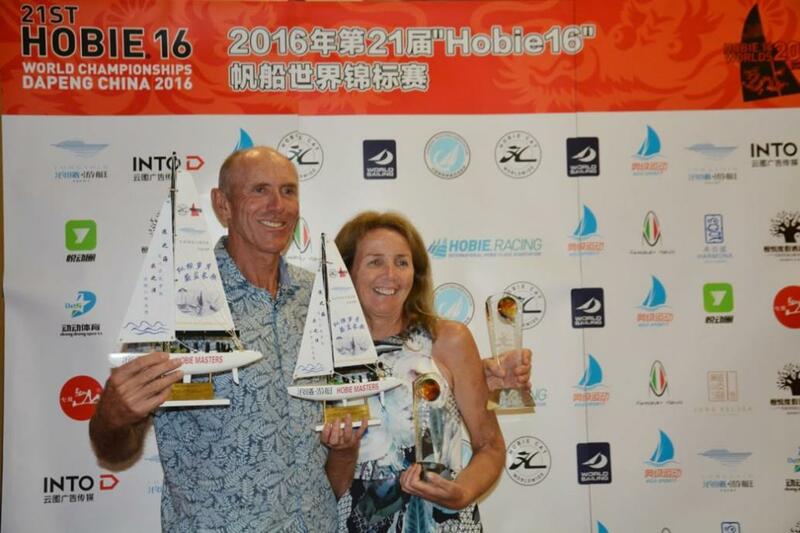 After a series of 15 races over 4 steamy days Palm Beach Sailing Club’s Rod and Kerry Waterhouse have won the Masters division of the 21st Hobie® 16 World Championships in Dapeng, China this week. Despite the fact that the Australians led the series from the very first race and were never headed in the regatta it was always an amazingly close contest. Positions fluctuated at the top from race to race and everyone in the top 5 had a chance to win going into the fourth and final day of this incredible series. “It’s been quite an amazing event back to back. Kerry and I are pretty close we have been sailing together for 40 years now on Hobies so we really know each other’s game and we support each other through good and bad. " Rod said on Thursday as the Masters series wrapped. 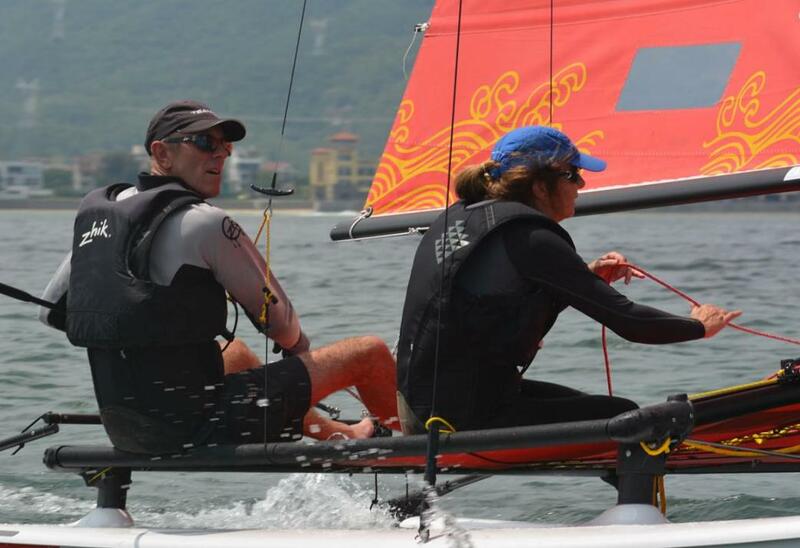 On Friday, June 3rd, the Grand Masters races commenced with Rod and Kerry leading after Day One and fellow PBSC members John Duchatel and Evelyn Curtis in second position and Michael Montague and Kathleen Ward from the USA in third. 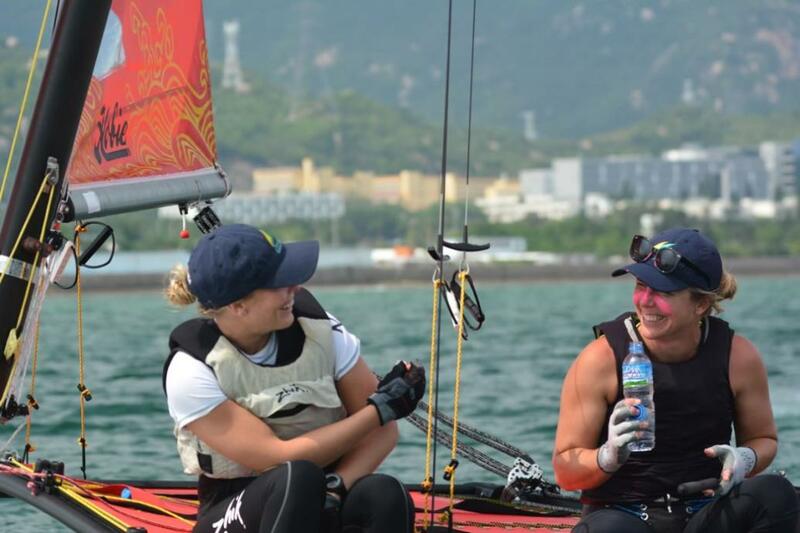 The Women’s Class is headed by another Pittwater sailor, past Olympian Nina Curtis, who is teamed with the skillful Haylee Outteridge. The girls lead out three Australian teams that complete the Women's top three at this stage; Meagan Bursa and Bonnie Butler and the team of Krystal Weir and Georgia Warren-Myers. The National Parks and Wildlife Amendment (Adjustment of Areas) Bill 2016 was passed on Tuesday, May 31st, 2016. Item () (iii) of this allows for the taking an area of about 0.768 hectare, from the Ku-ring-gai Chase National Park to facilitate the upgrade of Mona Vale road west. Part of the speeches during the Reading of this Bill focused on the necessity to make provision for a fauna bridge. This part of Ku-ring-gai Chase National Park, where it relates to the Mona Vale Road West upgrade, will be transferred to Roads and Maritime Services, Mark Speakman, Minister for the Environment, Minister for Heritage, and Assistant Minister for Planning, reiterated during this week's Parliamentary sessions. The pre passage speeches and readings included a noting by the the Hon. John Ajaka, Minister for Ageing, Minister for Disability Services, and Minister for Multiculturalism, who moved the motion for the second reading, that the Mona Vale road west upgrade includes a proposed fauna bridge that will connect Garigal and Ku-ring-gai Chase national parks. This will be the first fauna bridge in the Sydney metropolitan area. Today, Sunday June 5th, is World Environment Day. This year’s theme for WED – Go Wild for Life – encourages you to celebrate all those species under threat and take action of your own to help safeguard them for future generations. This can be about animals or plants that are threatened within your local area as well as at the national or global level. Run by the United Nations Environment Programme(UNEP), in the lead up to WED 2016 the United Nations, backed by A-list celebrities from across the globe, launched an unprecedented campaign against the illegal trade in wildlife that's pushing species to the brink of extinction, robbing countries of their natural heritage and profiting international criminal networks. Looking after our own local animals, our wildlife, to preserve and prevent their destruction, needs a big boost too. This week news was received that Dr. Howard Ralph has closed the Sydney practice for Southern Cross Wildlife Care, and will have only Braidwood's Clinic from now on. Dr. Ralph was one local veterinarian who treated injured wildlife locally - it would be hard to calculate just how many lives he has saved. Dr. Ralph worked in conjunction with Sydney Wildlife rescuers and carers. Sydney Wildlife is the 100% voluntary organisation that brings birds, reptiles and mammals who need treatment to local vets. Each year they receive in excess of 13,000 calls for help in just the Sydney Metropolitan area. They are not veterinarians and sometimes the wildlife need treatment that can only be provided by a professional veterinary surgeon. At present some local vets will do their utmost to save our injured wildlife as well as bearing the medical costs incurred. Anyone who has had to take their own pet to an animal clinic knows how expensive surgery and animal specific anesthetics, and required medicines are to save that loved one. The volunteer rescuers and those who care for these animals post-treatment, until they can be returned to their homes, bear all other costs, including feeding, heat mats, electricity costs, cages, etc. and all also do all their work in caring, 24/7 in the cases of very young animals, in a 100% voluntary capacity. Ensuring a Wildlife Mobile Clinic becomes a reality for the furry, scaled and feathered residents of our area when they need our help will support Sydney Wildlife's capacity in treating and caring for injured, sick and orphaned wildlife. Sydney Wildlife rescuer and carer Lynleigh Greig will continue running her monthly wildlife column and features here. From time to time her daughter Kayleigh, another champion of and for our local wildlife, and Pittwater Young Citizen of the Year 2016, will contribute items from the her generation’s perspective. Joan Reid, Facility manager of the Sydney Wildlife Rehab Facility, will also continue to send in updates. 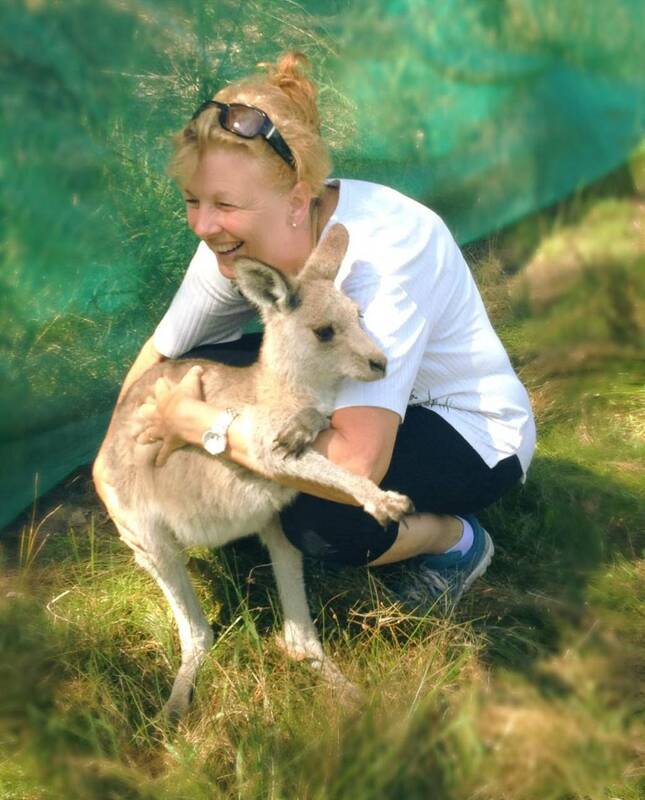 Joan Reid, Facility manager, with one of the kangaroos at the Sydney Wildlife Rehab Facility. 14 of the 22 Artists showing new works in Avalon Surf Club as part of the Pittwater Artists Trail 2016 Winter Exhibition - AJG picture. Teeming rain didn't keep guests away from the opening of the 2016 Winter Exhibition of new works from the members of the Pittwater Artists Trail on Friday, June 3rd. With feasts for the eyes and senses arranged in wings off a central display of ceramic sculptures, all leading towards Geoff Searl's sculptures from native seeds and pods, or a colourful side of Robyn Parks brilliant silks to the west and Penel Bigg's glass works to the east, the space was well curated, allowing people to view without feeling closed in, even when the room became full with latecomers. Brilliant new works by Julie Hickson, a stunner by Nada Herman, native flowers by Wendy Grainger, Claire Armstrong's fish that mesmerises, Elfriede Bartnitzky's textured depths, the peace in Jacqui Giuliano's paintings, the layers of glaze and shape melded in Willi Michalski's works, the list goes on and makes you wish for a more bountiful cheque book so you could have them all! 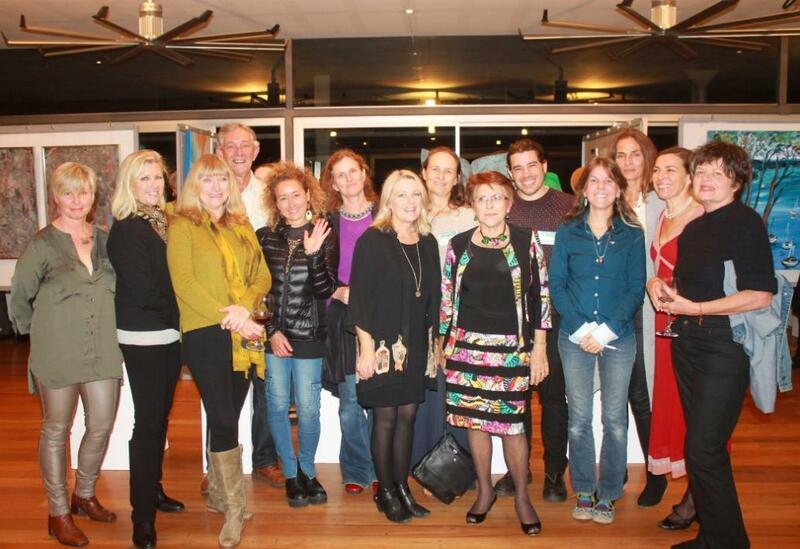 The annual Pittwater Artists Trail Winter Exhibition is open through to 3pm, Sunday 5th June. Treat yourself to something beautiful and stroll through these great new creations then sit back and watch the swell predicted for today while sipping something cool or having a snack at The Avalon on the Beach. Bliss! 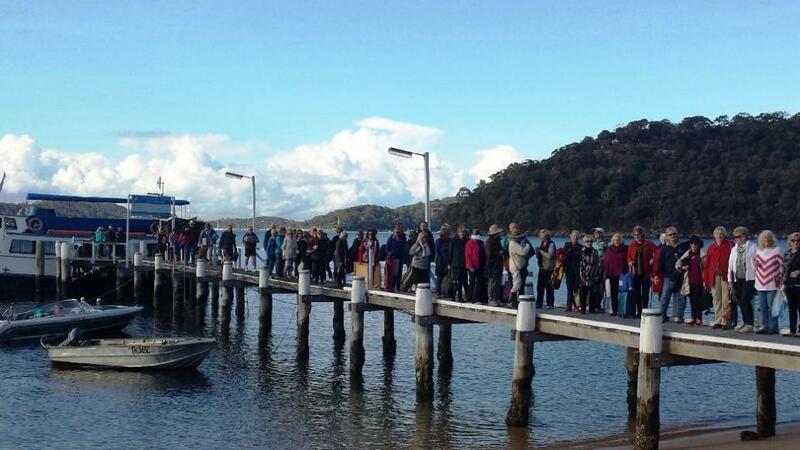 In 2016 the Pittwater Artists Trail have an event planned for the first weekend in each season. All studios are open in March, September and December and the group exhibition, held again in June this year. If you miss out this weekend, the next opportunity will be visiting the Artists in their studios, first weekend of Spring 2016 - September 3rd and 4th. MC and local musician Jim Pike set a wonderful tone with offering up a few wonderful words in opening this year’s Winter Exhibition. Jim was the 'Instant Poet' on Channels 9’s Midday show with Ray Martin for 8 years, and pioneered lifestyle TV, first as a writer and then reporter on Burke’s Backyard for 13 years. He’s also written satire, comedy and documentaries for stage, screen and TV with over 300 hours of syndicated comedy for radio alone. Jim is married to Pittwater Artist Trail member Karen Pike, creator of divine jewelry. Around 60 people attended the 2016 Mermaids of Palm Beach Currawong Day for Variety - the Children’s Charity, at peaceful Currawong beach on Thursday, June 2nd. Ladies from the Palm Beach Golf Club made wonderful use of the golf course, while bridge was played on Midholmes verandahs or tennis on the court. Among the guests this year at Car 2108's Variety fundraiser at Currawong, were several other Bashers joining the girls for a day off in the sun. Norma Dwyer, who makes the gorgeous necklaces and bracelet’s the Mermaids give to the children they meet on the Bash, 700 so far!!! !, was in attendance too much to Beryl, Elyse and Viktorija’s delight. 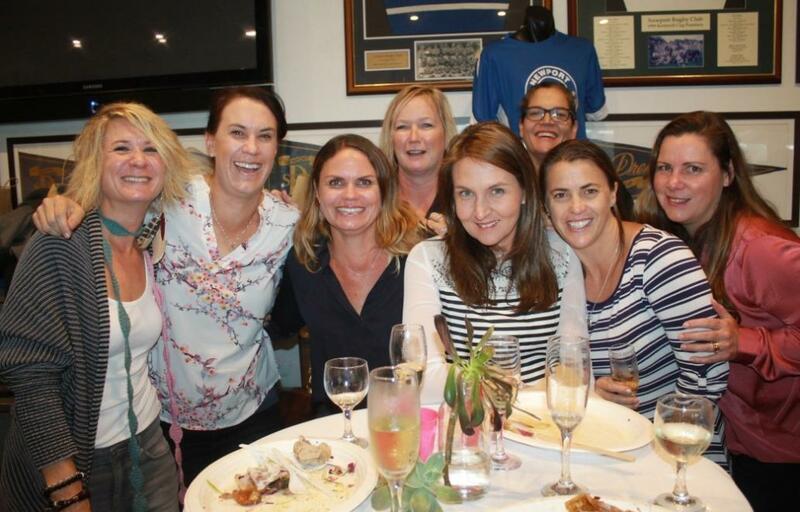 Car 2108’s Annual Mermaids of Palm Beach Dinner at Club Palm Beach (Palm Beach RSL) will take place on Monday August 1st this year – details and tickets will be available soon – watch this space! Beryl Driver, Elyse Cole and Viktorija McDonell are the Mermaids of Palm Beach. By 2013 the Mermaids had raised close to $500 thousand dollars for Variety - the Children's Charity. Subsequent years have added over $25 thousand in 2014, and 2015. Despite the rain and storm force winds on Saturday June 4th, the ladies of Newport Rugby club went ahead with their annual get together, moving it into the clubhouse instead of under the marquee originally planned. Although the field was closed and the games scheduled cancelled, the girls enjoyed a few hours and some great food and even better company. 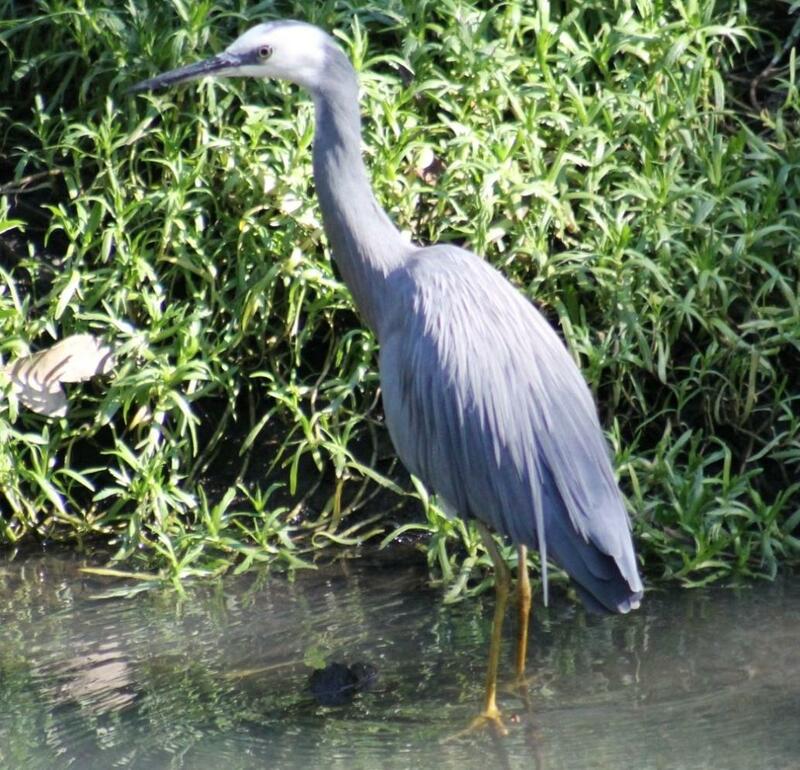 White-faced Heron in Careel creek - Photo by A J Guesdon. 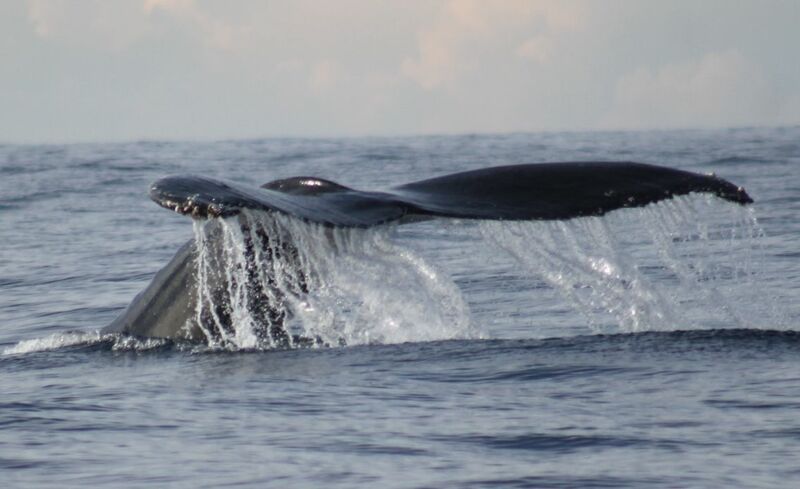 World Ocean Day is June 8th each year. The 2016 theme for World Ocean Day is 'Healthy Oceans, Healthy Planet' with a focus on plastic pollution, not only the clean up which must be ongoing but stopping this from occurring at its source. Plastics are choking our oceans, all they are home to and all that finds their home beside and around them. As the planet's oceans produce most of the oxygen we need to breathe, as just one item at the top of a long long list, not using microbead products, not buying disposable bottles or using plastic bags, will begin to stop this pollution at its source. This parallels the 2016 theme for World Environment Day, June 5th each year, Go Wild for Life. This theme is to encourage everyone to celebrate all those species under threat and take action of your own to help safeguard them for future generations. This can be about animals or plants that are threatened within your local area as well as at the national or global level. At least two generations in Pittwater will remember when their shopping was packed in brown paper bags or cloth-string bags brought from home. That's how quickly this form of pollution has been in its disastrous effect on our oceans. In the NSW Environmental Protection Authority's 2016 published Plastic shopping bags options paper the Introduction states, "based on 2007 data, approximately 3.9 billion single use light weight plastic shopping bags are used annually. In 2003, 86% of Australians said they recycle or reuse plastic bags, primarily re-using them as bin liners around their homes. Given population, consumption and the end of the Australian Retailers Plastic Bag Code of Practice, plastic shopping bag consumption appears to be steadily increasing. Tasmania, South Australia and the Territories have already banned the use of those grey shopping bags we still find in our supermarkets. The NSW Government, along with Queensland and Victoria, are still dragging their feet. Interestingly the Victorian representative to the above convened Feb. 2016 meeting, in announcing their concurrence to 'continue working towards' approximate double the amounts of plastic bags being consumed - or "Approximately 7-8 billion plastic bags are consumed nationally each year." The current cost each one-use plastic bag is estimated at 2-3 cents. A 2005 Case Study, “... our future, is in the bag” of the Riverina Eastern Regional Organisation of Councils aimed to reduce plastic bag use by exchanging plastic bags for calico bags resulted in 400 thousand plastic bags being diverted from landfill in three months.The members of REROC are/were the councils of: Bland, Coolamon, Cootamundra, Greater Hume, Gundagai, Junee, Lockhart, Temora, Tumbarumba, Tumut, Urana, Wagga Wagga, Goldenfields Water and Riverina Water. REROC covers an area in excess of 43,000 sq. kms and a population of approximately 140,000. The NSW Government has taken a much speedier approach to turning the tide on plastic bottles though, announcing on May 8th 2016 the long awaitedContainer deposit scheme, wherein "Beverage suppliers (manufacturer, importer, wholesaler or retailer) that bring eligible containers into NSW will be responsible for funding the refund as well as associated costs." Once again there are at least two generations in Pittwater who will fondly remember collecting cans for cash for pocket money for lollies, ice creams and other associated childhood health foods, or for your local club - Scouts, Girl Guides, Sailing, Surf Life Saving. Living Ocean, who lead the local charge to decrease plastic bottle use, and clean up the insidious return to our creeks and beaches on a regular basis of all rubbish, mostly these (and straws, plastic bottle caps), are also the residents whose members have joined with the Surfrider Foundation to establish Avalon Boomerang Bags. Boomerang Bags are hand made reusable returnable cloth bags. Their aim - make Avalon plsic bag free and then extend it out from this village to those that surround Avalon Beach. Weekly sewing bees are held on Tuesdays from 11am to 5pm at Avalon Recreation Centre. Donations of materials or getting involved is welcome. You keep up to date on the Avalon Boomerang Bags facebook page. Living Ocean, through their ongoing 'No Plastic Please' initiative aims "to create a positive behaviour change within our community by encouraging more sustainable consumption of items such as: plastic bags, bottles and coffee cup lids." On Monday the 6th of June Living Ocean will be sharing the film Racing Extinction at Cranzgots Pizza Cafe. An eye opening, inspiring, and life changing documentary that discusses the destructive impact we as a human species are having on the planet. From the same film makers that made 'The Cove', Racing Extinction is a must see. Tickets are $20 which includes delicious Vegetarian Pizza. The next Living Ocean/Wander Lightly beach clean up organised is at Newport on Sunday,19th June. Last Sunday, May 29th, Living Ocean, with Wander Lightly and over 30 of their supporters collected; 113 Plastic Shopping Bags, 183 Glass Bottles, 145 Plastic Bottles, 230 Cigarette Butts, 271 food wrappers, 60 plastic food containers, along with larger items - retrieved from Living Ocean from Facebook page - all of this was then sorted into recyclable piles and disposed of by those doing the work. Pollution of this sort can also be stopped at its source too of course, or when spotted (take action), picked up. Healthy Oceans and a Healthy Planet must come from a Living Ocean. 1. © State of New South Wales and the Environment Protection Authority 2016.